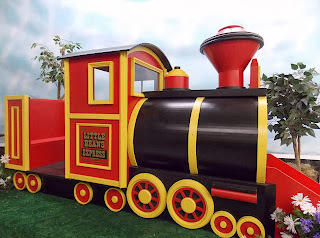 Check out this cute indoor playhouse that looks like a train engine. We created it for our friends at Little Beans Play Cafe in Chicago. Once the children have their conductor's hat on, they can climb inside to discover a little tunnel and slide! Kids can crawl from the cab through the boiler and slide down the cow catcher. All aboard!